This switch is pretty easy, but how in the world did catsup end up on the top 10 list? Tomatoes contain an important nutrient called lycopene, one of nature’s most potent antioxidants, known to help prevent and heal cell damage. Foods rich in lycopene can lower cancer and heart disease risk. Tomatoes are, by far, the #1 source of lycopene in the American diet, providing an estimated 80% of the lycopene consumed30. What’s the major source of tomatoes? In 2006, the average American ate 94 pounds of tomatoes, and of this more than 73 pounds came in the form of processed tomato products: tomato juice, tomato paste, catsup, etc31. And in kids, tomato products (especially catsup) make up an even higher percentage of the diet. In fact, catsup makes up so much of kids’ overall vegetable intake that the government even tried to count it as a vegetable in the school lunch program during the Reagan years. Recently, scientists at the USDA Western Regional Research Center decided to analyze catsup levels to see if catsup is an okay source of lycopene (yes) and other antioxidants (yes). They looked at national brands, store brands, little catsup packets, and the catsup on fast food burgers. The scientists were surprised to learn that organic catsups were, on average, 57% higher in lycopene. And they had double the antioxidant power of conventional catsups32. One organic brand contained 183 mcg/g of lycopene – more than three times the amount in a conventional brand, and about five times as much as in a fresh tomato33. In general, a deeper red natural color goes along with higher lycopene levels. And organic catsup tastes great! Just switching from conventional to organic catsup could significantly increase the nutrients in America’s diet and decrease conventional tomato farming methods. How simple! And you might want to think about switching to organic marinara and pizza sauce at the same time. 30American Dietetic Association. Nutrition Fact Sheet: Lycopene – An Antioxidant for Good Health. Accessed Feb 13, 2007. USDA Food and Nutrition Information Center. Antioxidants, Phytochemicals and Functional Foods. September 11, 2006. Accessed Feb 13, 2007. In a search of foods highest in lycopene, 38 out of the first 40 on the list were tomato products. Only watermelon and guava also made it into the top 40. The next important non-tomato-based sources are pink grapefruit at number 60 and red bell peppers at 91. Tomato sauce has more than 50 times the lycopene per calorie as a red pepper. 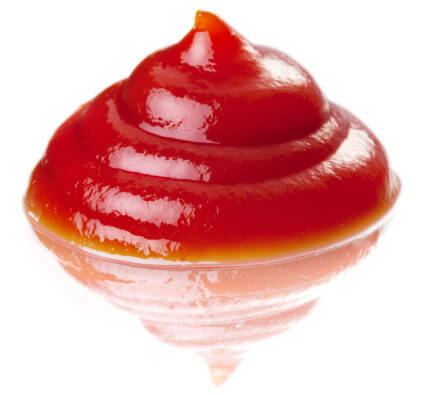 Catsup has 15 times the lycopene per calorie as a red pepper (and more than 50 times the lycopene per ounce). According to the USDA Food Consumption (Per Capita) Data System, March 3, 2006, Americans only eat, on average, 13 pounds per year of watermelon, 7 pounds per year of all bell peppers (not just red bell peppers), and 7.9 pounds per year of all grapefruit (not just pink grapefruit). Per capita guava consumption is not available. 31USDA Economic Research Service. U.S. per capita use of selected, commercially produced, fresh, and processing vegetables and melons, 1970-2006. 2007. 32Ishida BK, Chapman MH. A Comparison of the Carotenoid Content and Total Antioxidant Activity in Catsup from Several Commercial Sources in the United States. Journal of Agricultural and Food Chemistry, Dec 29 2004 52(26). 33USDA National Nutrient Database for Windows. Standard Release SR-19.